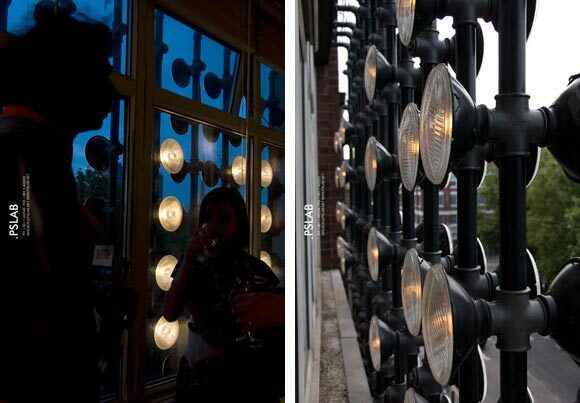 'STREETLIGHTS', a .PSLAB intervention on DOSarchitects studio’s external façade for Clerkenwell Design Week London, United-Kingdom. May, 24th -26th 2011. 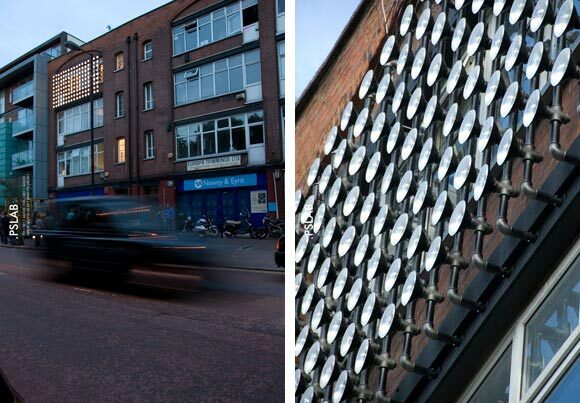 On the occasion of the 2011 Clerkenwell Design Week, multi-award-winning design company DOSarchitects and creative lighting firm .PSLAB launched a daring one-off temporary installation on the external façade of DOSarchitects’ studio, using original vintage car headlamps to light the street. 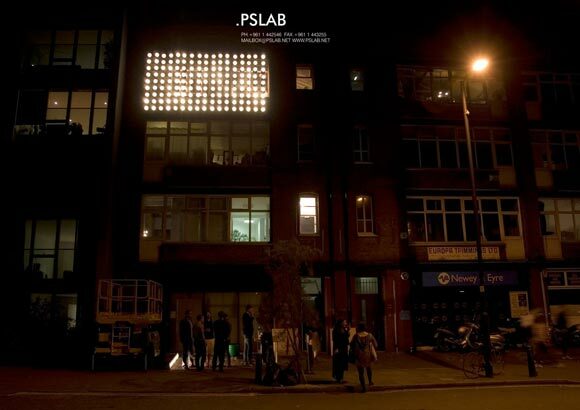 In 2008, .PSLAB created original lighting products for the DOS studio on Lever Street. In the offices’ entrance stairwell, .PSLAB adapted to the spatial needs of the site with vintage car headlamp fixtures. The red wiring for these products was made external and incorporated into the overall design, and an award-winning holder product – honourable mention at the Reddot Design Award 2009 - was developed to control the direction of these cables. 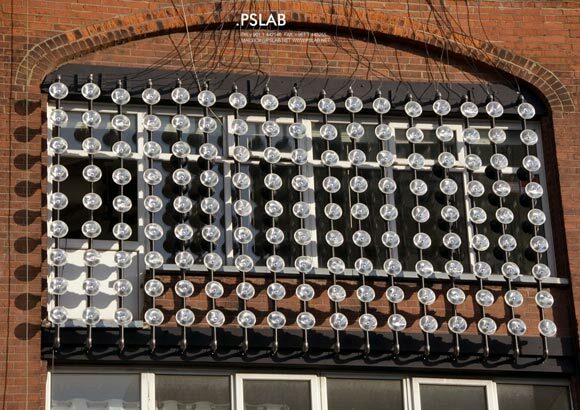 When planning their intervention for Clerkenwell Design Week 2011, .PSLAB drew on these headlamp fixtures for their external installation with DOS. 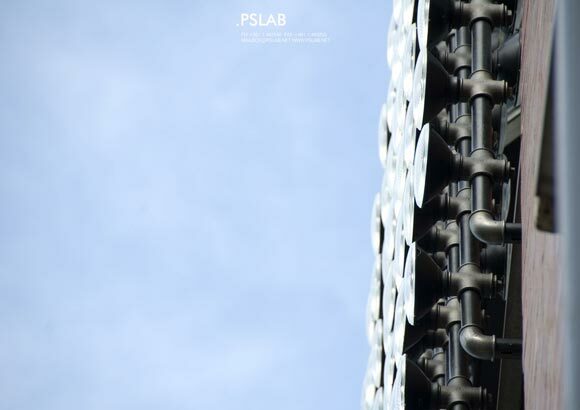 The large-scale public project represents a newly confident, tangible approach for .PSLAB. The temporary nature of the installation allowed a freedom of scale and vision not usually available for the exterior of a building. Lighting the entire office façade required overcoming the physical constraints of the site, mainly the uneven external surface of the building. The key technical detailing in this context was the metal ‘skin’ that was fixed parallel to the wall to overcome the constraint of the site’s uneven surfaces of varying materials, including brick, glass and steel. The steel ‘skin’ held the headlamp fixtures in a bold pattern, with the wiring hidden inside it. The lamps could be fitted with energy-saving light bulbs, and easily serviced from the interior of the offices. On 25th May 2011, over 200 colleagues and friends of .PSLAB and DOSarchitects gathered at the DOS studio on Lever Street to experience the installation. The piece was lit during the evening, projecting bold discs of light outwards into the street and inwards into the office space. In an informal evening of drinks and live music, there was conversation around design and architecture as images from both companies’ projects were projected onto the walls, and feedback on the installation was overwhelmingly positive. It will remain in place until June, 30th 2011. 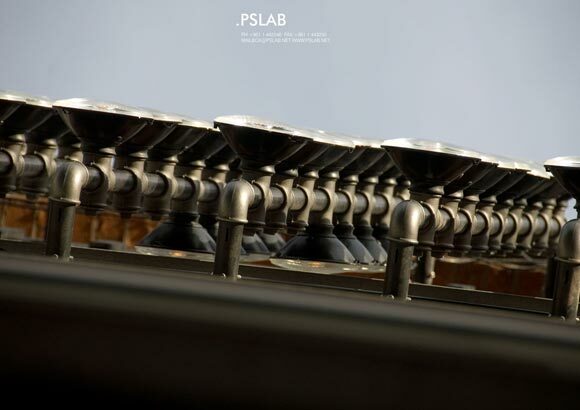 .PSLAB brings together a multi-disciplinary team of over 100 architects, designers, engineers, technicians and artisans. They develop lighting products, from concept to construction for context-specific spaces. They have given life to diverse projects’ types and scales from homes to shops, offices to restaurants, hotels to art galleries and gardens to exhibitions. Their original pieces have won many international awards and contribute to an accessible archive of customcrafted products, developed in dialogue with their teams – founded in Beirut, and now working worldwide from bases in London, Stuttgart and Bologna. They will be expanding their presence in London in the near future to include a new showroom. DOSarchitects was formed by Lorenzo Grifantini and Tavis Wright, who have worked with some of the world’s most prestigious architectural firms. Their combined vision has developed a multi-award-winning company - whose achievements include winning the 2005 Dubai Tower competition - that has established itself as a leading name and light among European architecture firms.